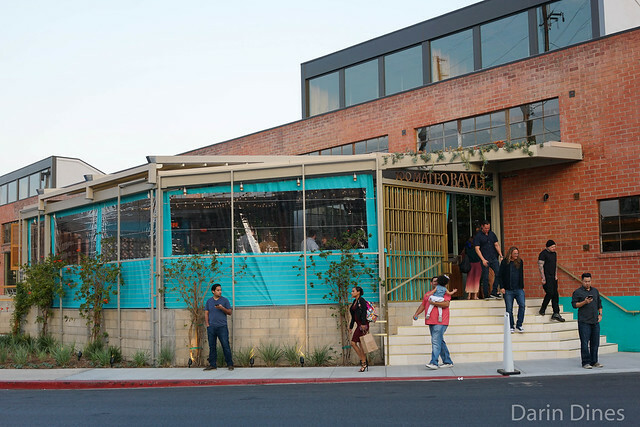 Yamakase has been on my radar since I first heard about it a couple of years ago. 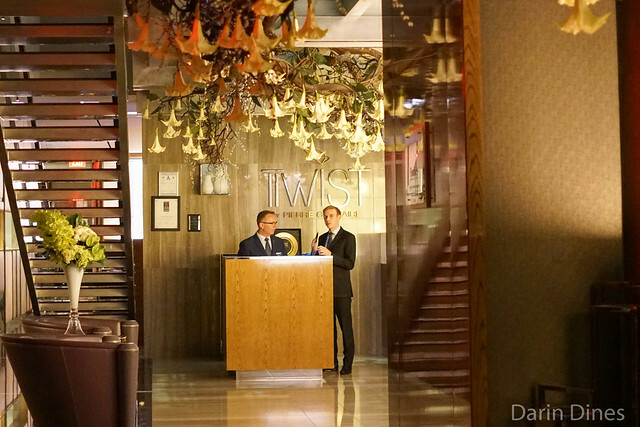 The restaurant is an invitation-only (request one here) “secret” Japanese spot serving high-end Japanese. 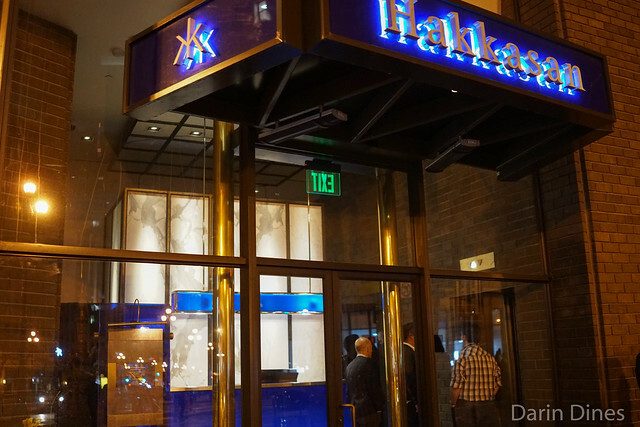 The meal may be best described as kaiseki, but it’s not really; it’s moreso a progression of sushi/sashimi and small plates of whatever the chef wants to serve. The courses are definitely Japanese-centric but there are a handful with clear Western influences. 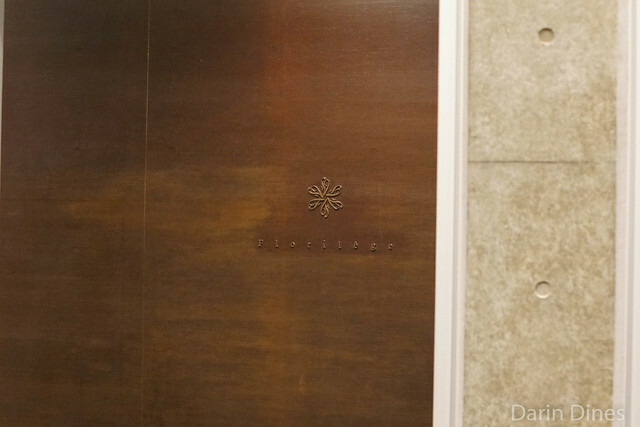 As expected, the meal is omakase-only with around 20-25 courses; the price varies somewhere in the low $200s. It’s a BYOB only affair. 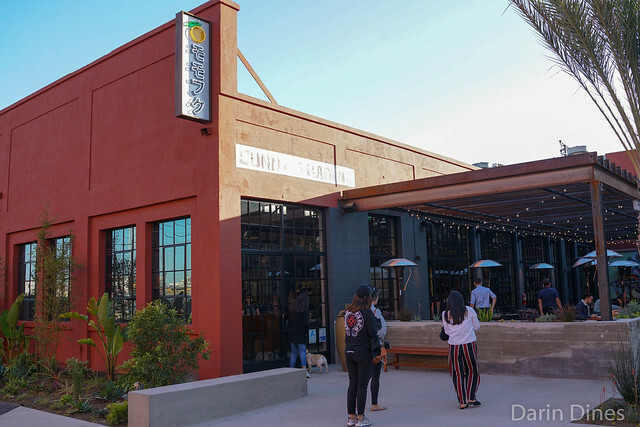 The chef here is Kiyoshiro Yamamoto (Yama-san) formerly of Santa Monica’s The Hump which closed amidst a ton of controversy. 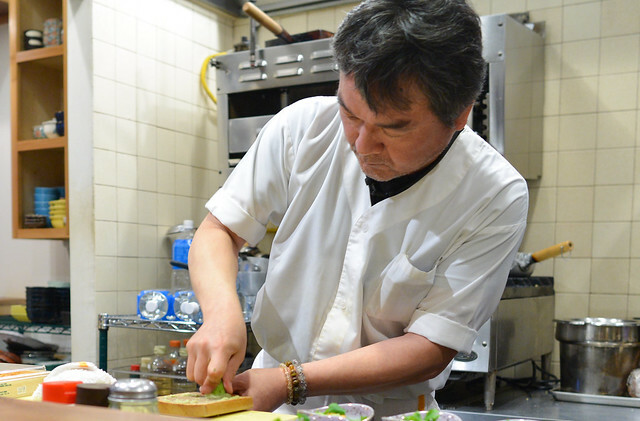 Yama-san is a one-man show and the ten-seat bar curves around the kitchen giving everyone a full view of the preparation of the meal from start to finish. 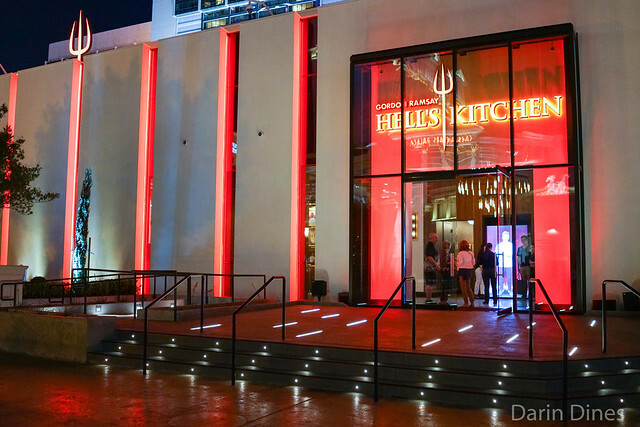 For the food-enthused, it’s as much a show as a meal. 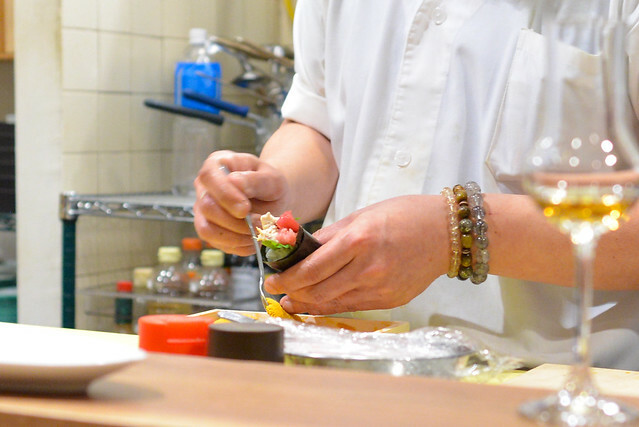 On this evening, Yama-san began by expertly breaking down a huge bluefin tuna loin, proceeded to prepare two Japanese hairy crabs for the steamer, then grated fresh wasabi root and shaved some truffles. It promised to be an exciting meal even before the first bite. 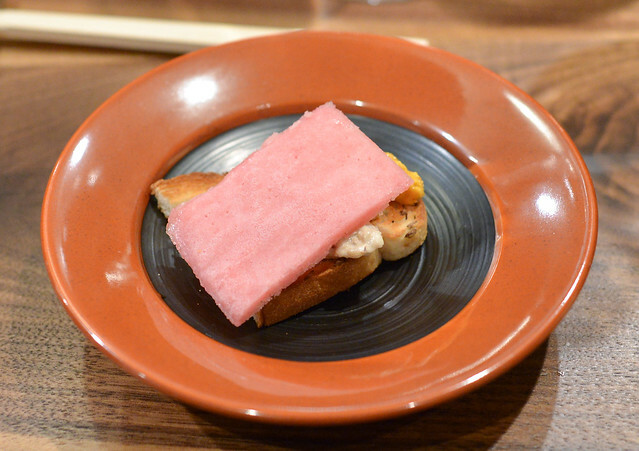 The meal started strong with a duo of ingredients from Hokkaido – tofu and uni. 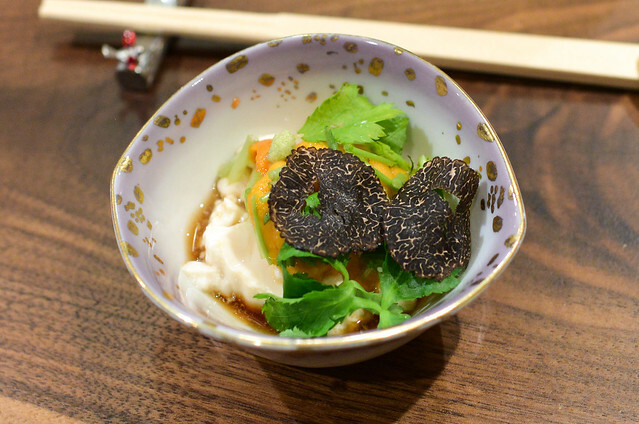 The creamy rich tofu blended well with the sweet uni and slivers of earthy truffle. Bits of parsley brought some fresh grassy notes to balance it all out. 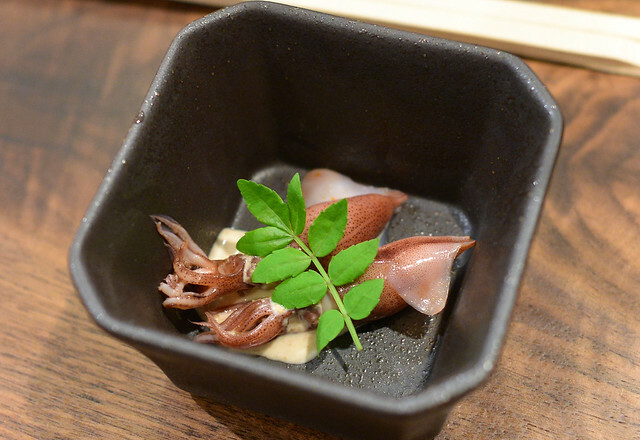 The tender, silky eel was something new for me (the eel I eat always seem to be cooked). 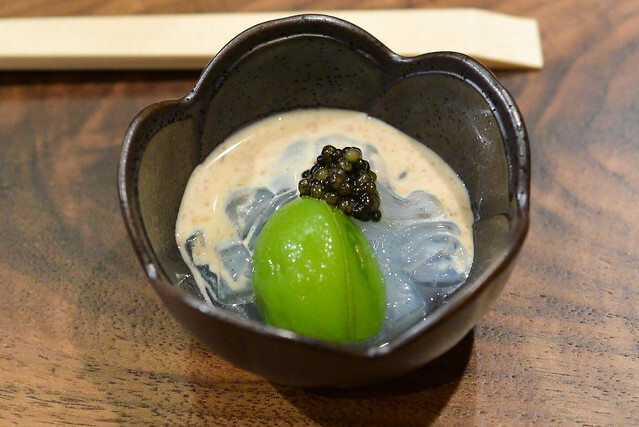 The supersweet peach was a nice pairing to the eel, while caviar added a finishing salinity to each bite. 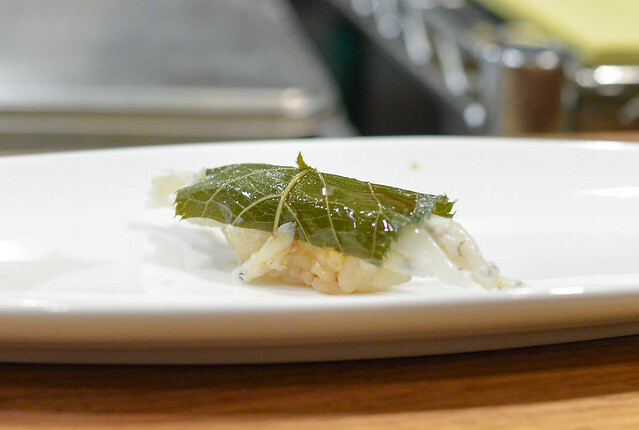 Halibut was steamed in an aromatic leaf and paired with some fruit notes (tasted kind of like apple but I don’t think that was it). 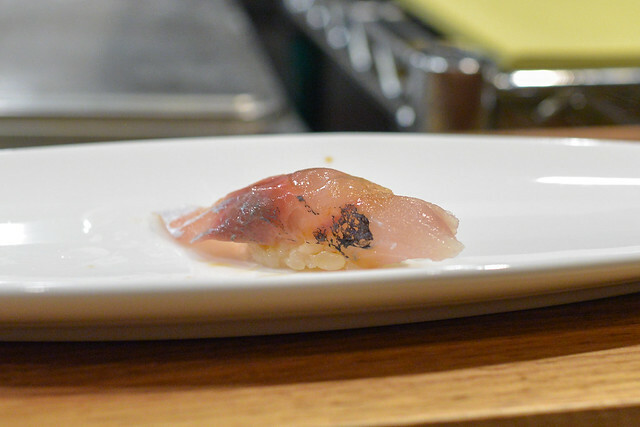 San Diego uni was a highlight of this dish with its large sweet slivers. 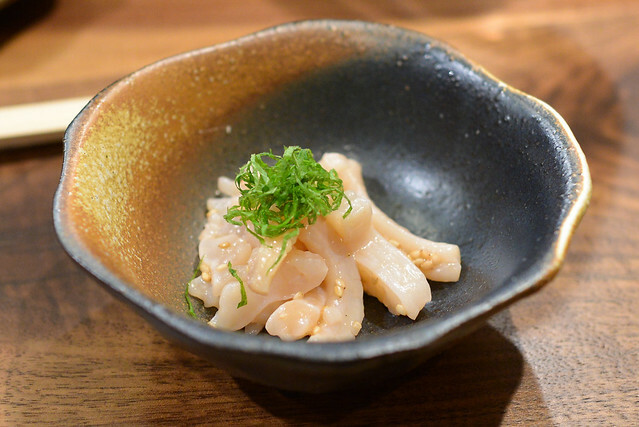 Red clam was also sweet and very tender, bathed in a delicious crab innards sauce. 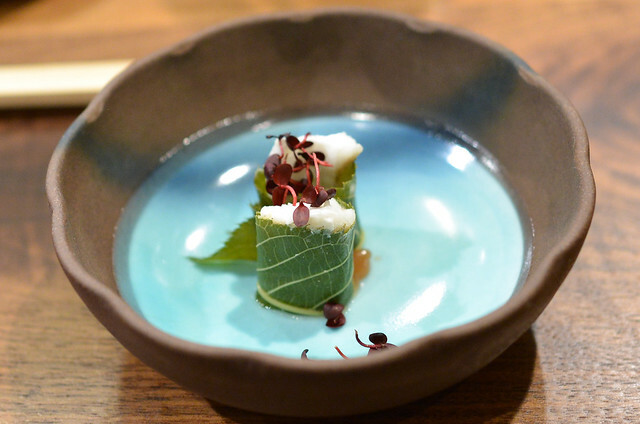 The clam had a nice chew to it, sweet, accented by nutty sesame and bright shiso. 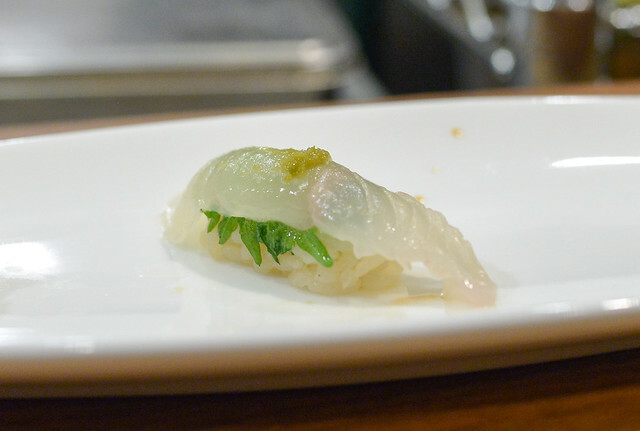 Loved the springy texture of the cold squid, very refreshing with the fresh bite of the greens. 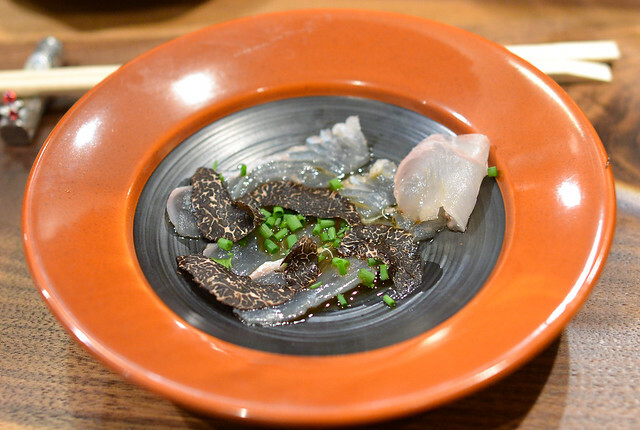 Mild halibut flavor was brightened by a ponzu and green onion while shaved truffles provided underlying earth tones. 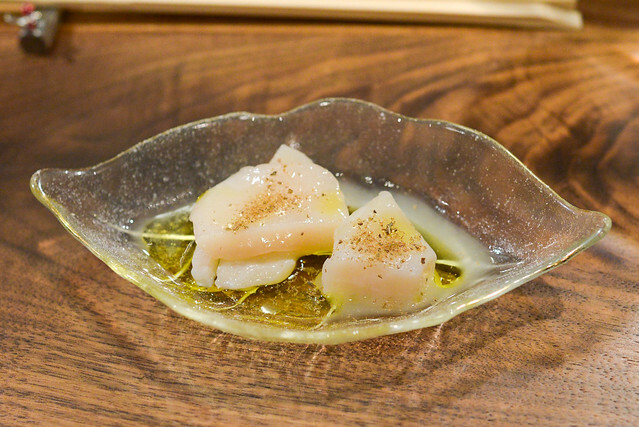 A duo of scallops was up next – a pen shell and the more typical variety from Hokkaido. It was fun to compare and contrast (the pen shell had a chewier texture and different kind of sweetness) while olive oil added a luscious mouthfeel with the Himalayan pink salt. An all-star cast of ingredients filled this spoonful; rich oyster and poached quail egg was tempered by cool uni and sweet crab. Delicious. 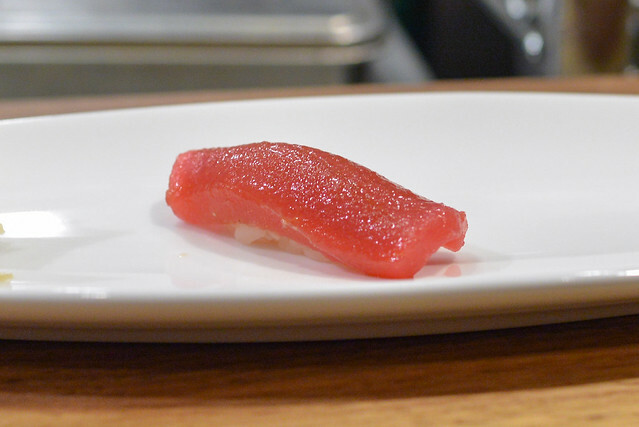 The tuna returned for this course after a quick cure in soy sauce. 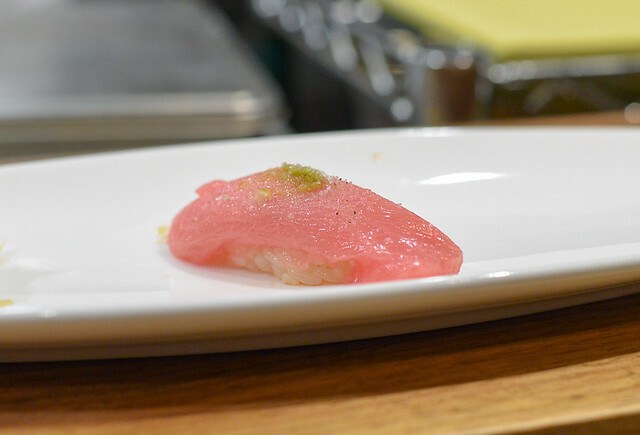 The lean tuna was subtly sweet and rich, contrasted by the bright fresh wasabi flavor. 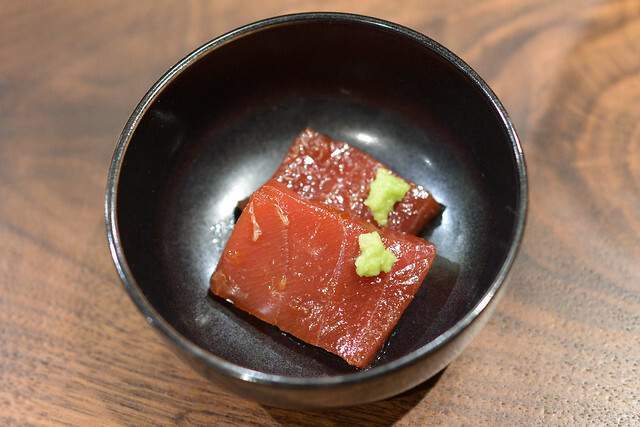 The tuna served as another course with the fatty belly chopped and served as a tartare. 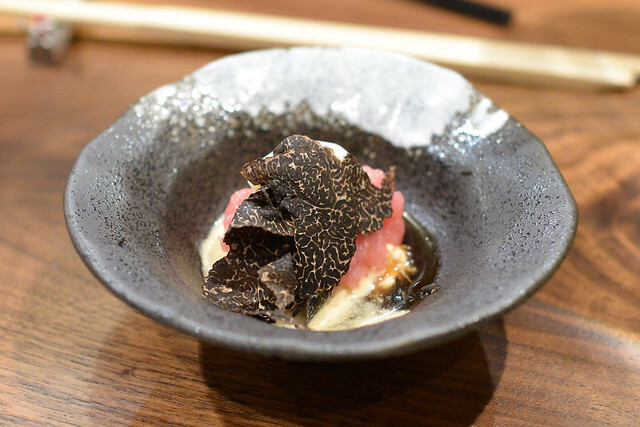 Blue crab and quail egg piled on the delicious flavors with a subtle truffle essence. 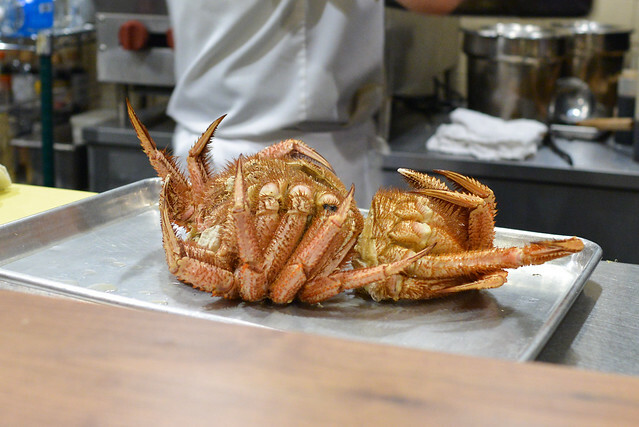 At this point in the meal, the Japanese hairy crabs returned. 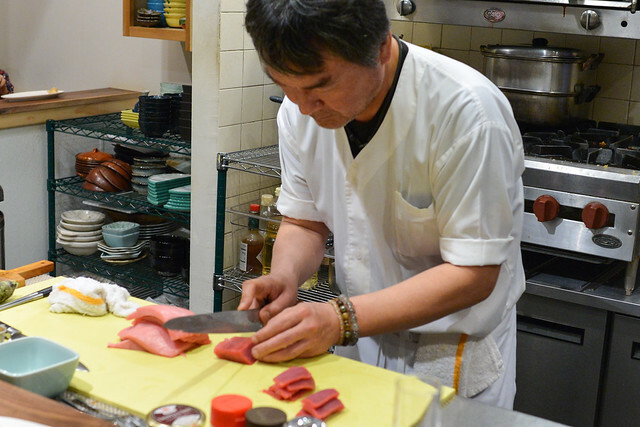 They were methodically and expertly sliced for easy eating. 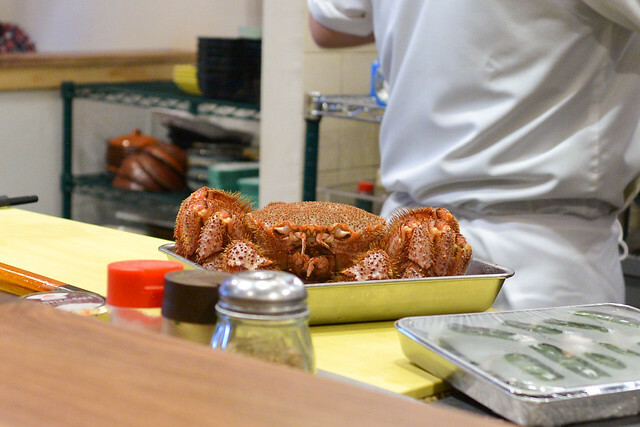 The simple steaming preparation really highlighted the sweet meat of these crabs – quite the treat. No sauce necessary. 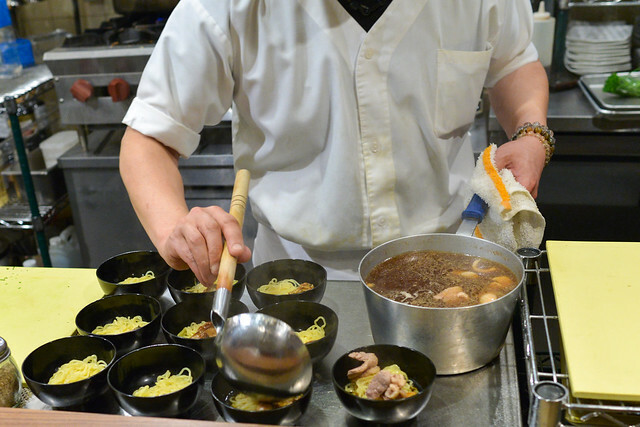 We were wondering what Yama-san was cooking with Japanese bottled water – it turned out to be ramen. Not the soup, but even the actual noodles were cooked in water from Japan. 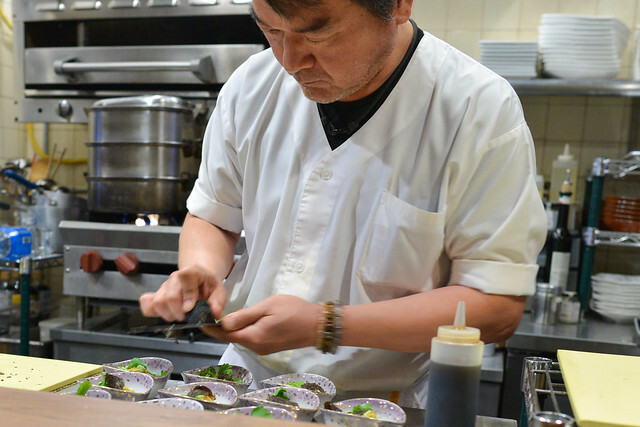 The noodles sat in a delicious and hearty shoyu broth and topped with grilled oysters and sliced duck breast. 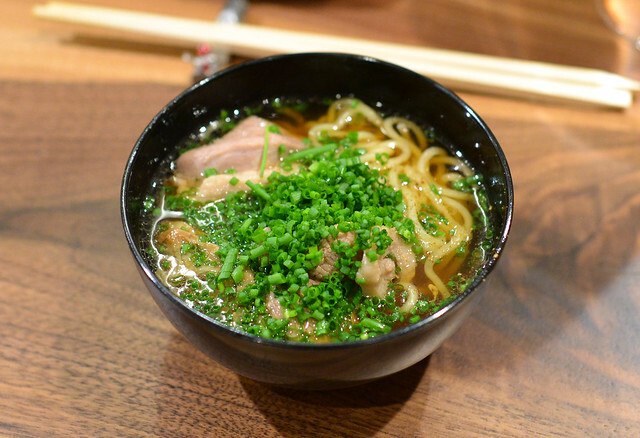 Yama-san explained that he rarely makes ramen, but this was such a treat…and really, really good. 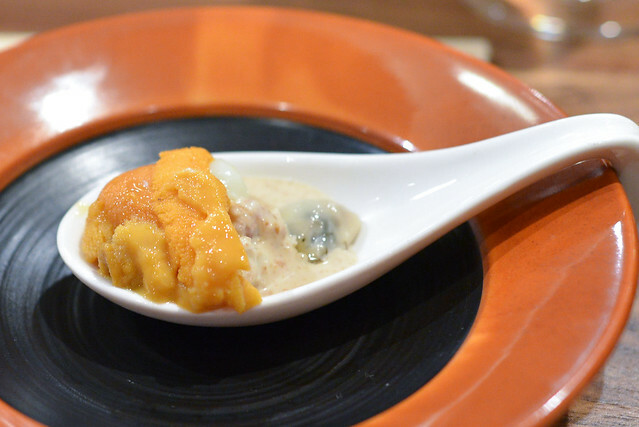 The next course was an interesting one; toast was smeared with a white truffle butter and topped with uni and blue crab. 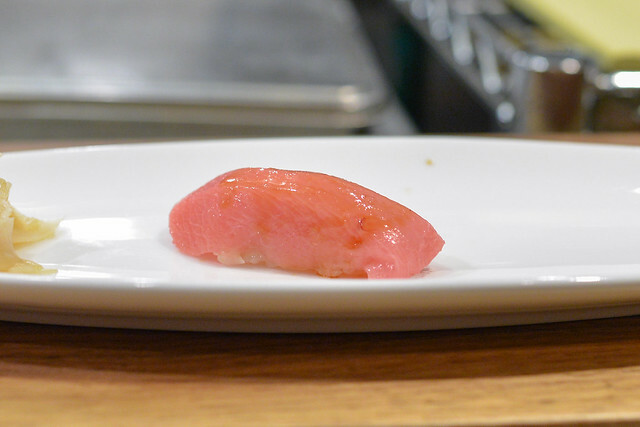 A thin, frozen slice of chopped toro topped it all off. Each flavor was evident in each rich bite, though I’m not sure if the sum was greater than its parts. 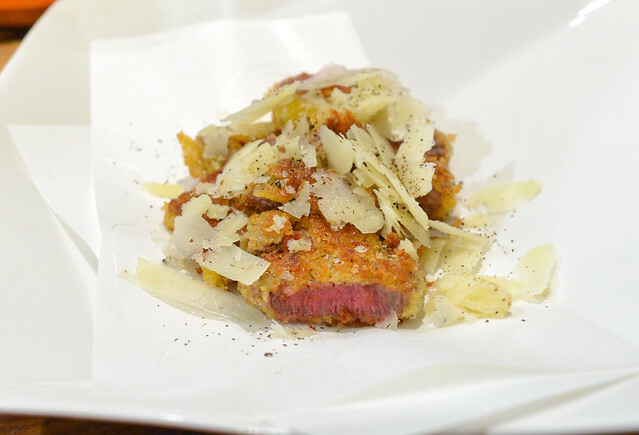 This was another treat – A5 wagyu filet from Kagoshima was battered with panko, seared, and topped with shaved truffled parmesan. So good. The beef was rich and luscious with a great crunch from the batter. Cheese added a little extra richness and good truffle flavor to each bite. 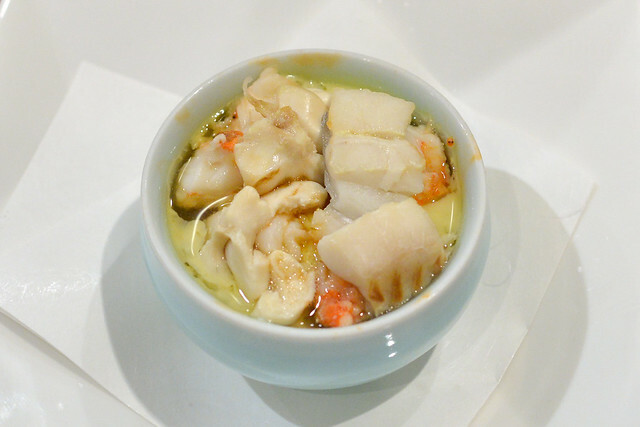 This chawanmushi was packed with seafood – shrimp, mackerel, clams – all cooked well. I rarely say this, but I actually wanted more of the actual silky smooth egg custard to bolster the egg:seafood ratio. After sixteen small plates, we moved on to the sushi part of the meal. Sushi was very good. 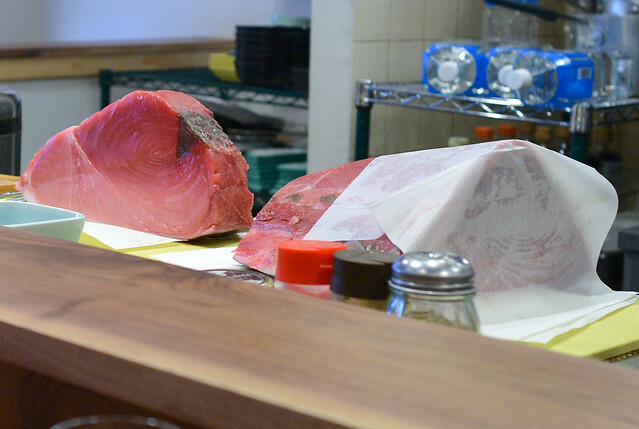 The tuna preparations were probably my favorites, highlighting the high quality tuna Yama-san procures. 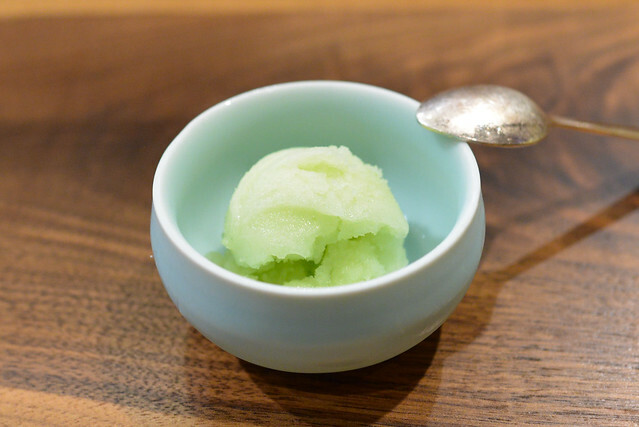 A lone dessert course of a crisp peach sorbet closed out the meal. 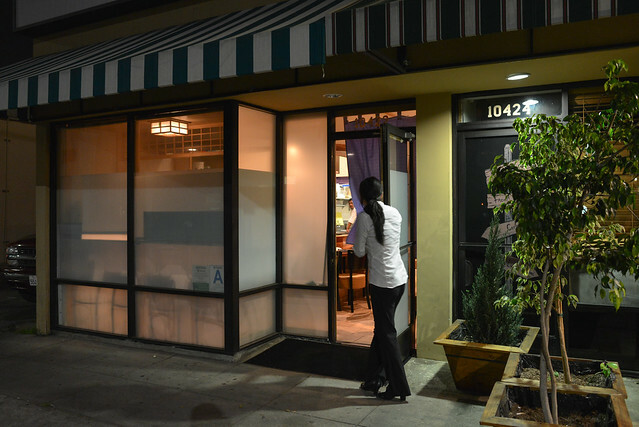 Yamakase presented one of the most enjoyable meals I’ve had in LA. 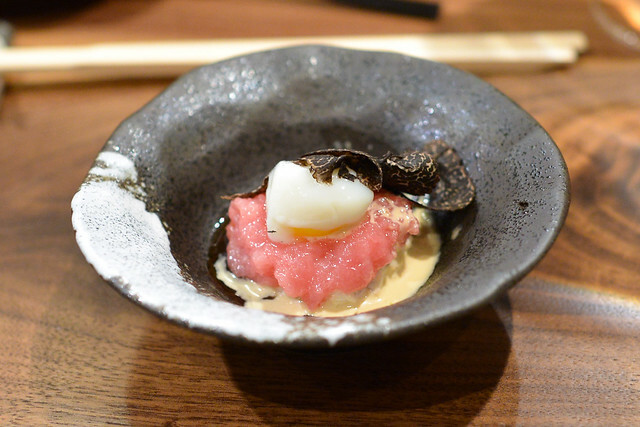 Critics may point to Yama-san’s reliance on certain ingredients (uni, tuna/toro, truffles, blue crab) and its repetition and I think that’s a fair point, but it made this meal no less enjoyable and delicious. Even with the “usual suspect” ingredients, there was quite a bit of variety over the course of the 20-something plates. 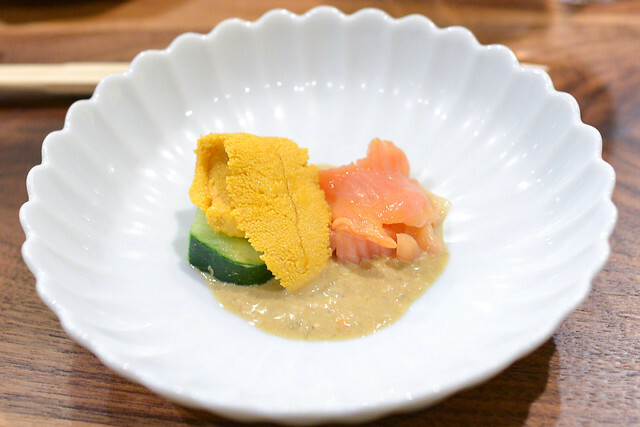 Plus, it’s rare to find a meal that includes high quality wagyu, hairy crab, and all of this uni, toro and truffle especially at this price range. 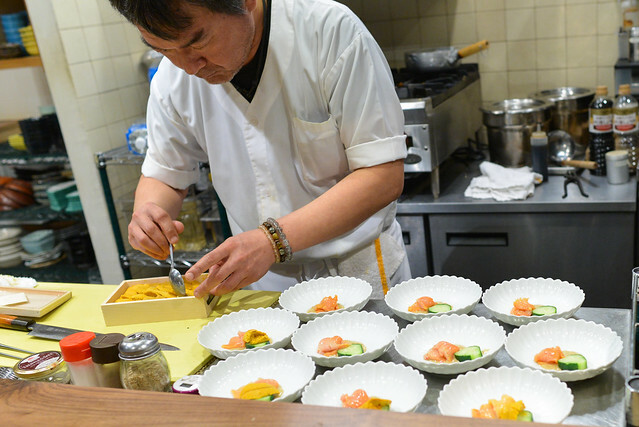 Yama-san’s craftmanship was on display for all to see and his execution was flawless; even the ramen, seemingly outside of his comfort zone, was excellent. 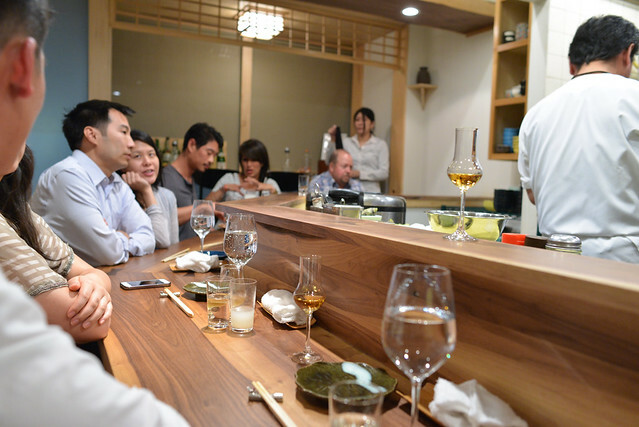 This food, combined with the ability to interact with Yama-san and watch the whole meal come together, made for a truly unique and memorable experience. very cool. can’t wait to go. I agree with your assertion about Yamakase. 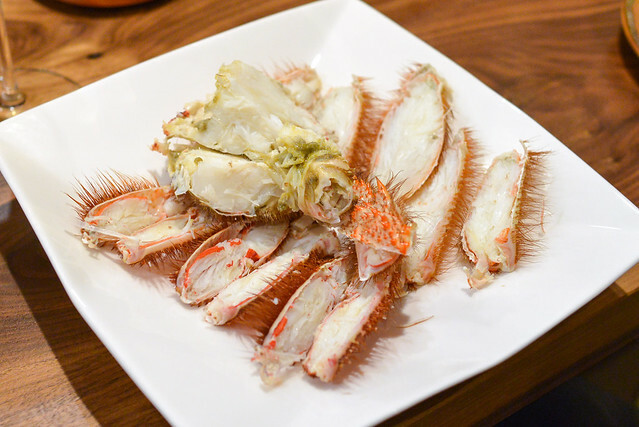 The amount of uni, hairy crab, truffle, other higher end ingredients is definitely plentiful for this price range. I enjoyed your blog since you made it simple. 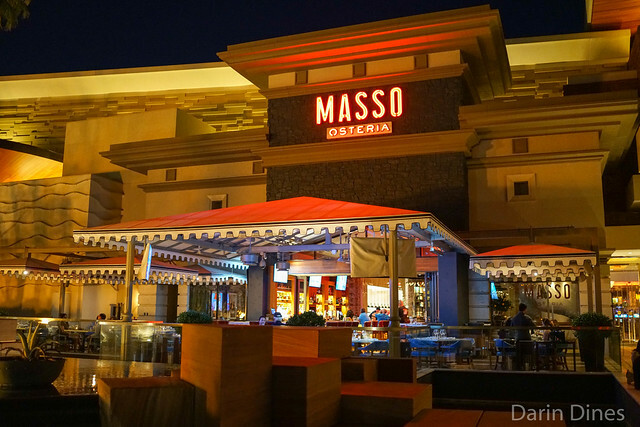 Only suggestion is to include the price of the meal (food only) for each review. Thanks. Thanks Peter. 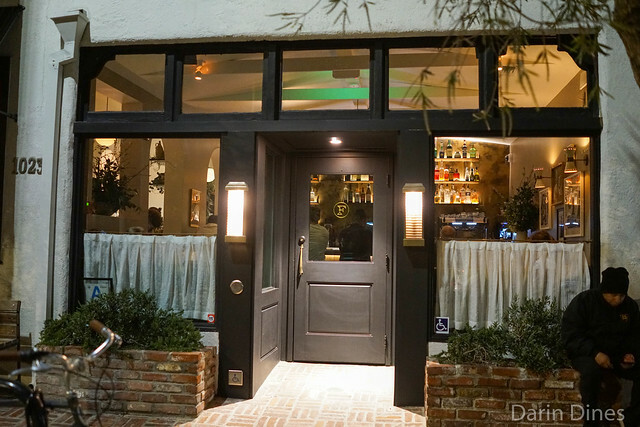 I tend to list only the prices on the tasting menus (sometimes I just plain forget when we order a la carte) but I’ll think of ways to incorporate more of this info. how early you request for the invitation? Can it do a week before or more earlier? Would recommend requesting one as soon as you think of it; they’re not that easy. A week in advance probably won’t be enough. thanks, usually how long do they reply you after fill the request form in their site? because I filled one like 3 weeks ago and didn’t heard anything back from them. 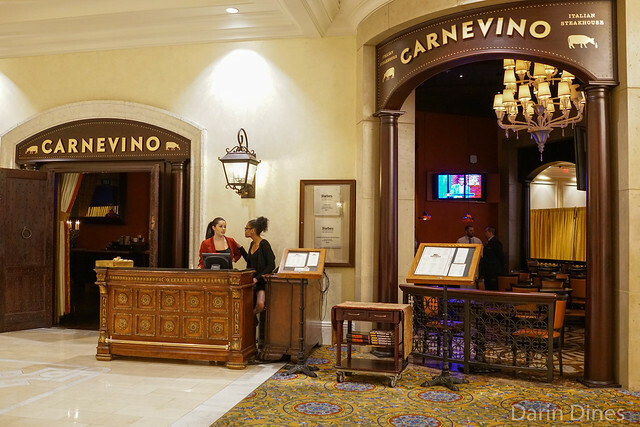 They responded pretty promptly when I made the reservation; I’d follow up again. 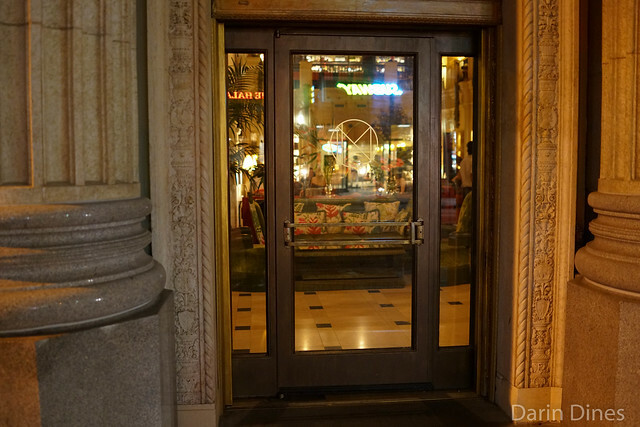 Darin – how do you think this compares to n/naka? If you had to choose, which one would it be? Hi Cammie – hard to say, they’re really different. 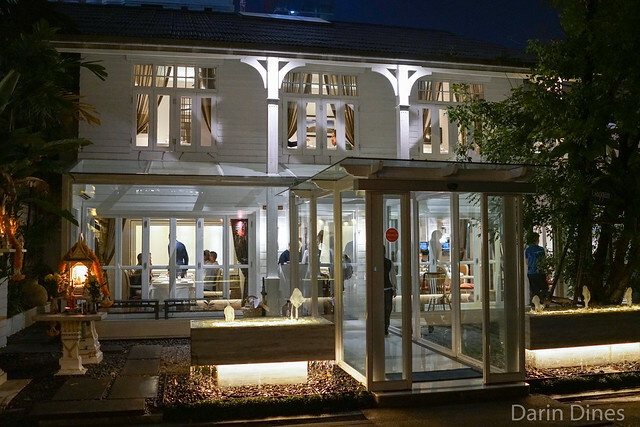 n/naka had a lot more balance to the meal from the first to last course, better service and a better decor. 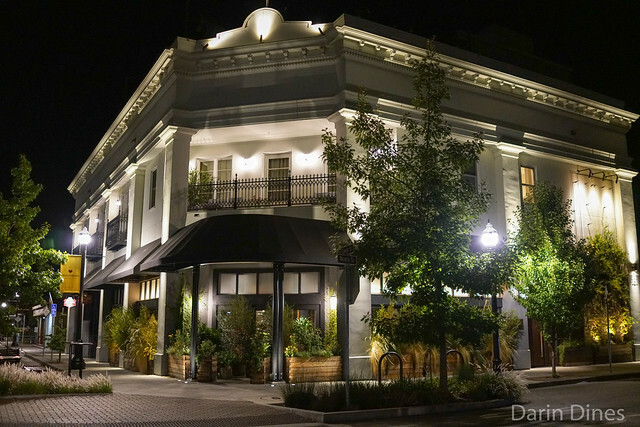 Maybe more ideal for a special occasion. 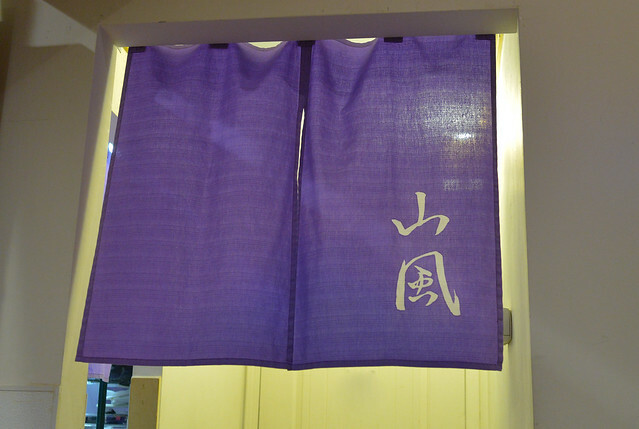 Yamakase was overall more delicious though.